Sociologists sometimes come back to George Herbert Mead as a founder who still has something important to contribute to contemporary theory. This is especially true in ethnomethodology and symbolic interactionism, but it comes up in current lively discussions of pragmatism and action as well. So what can we learn from reading Mead today? Let's take a quick tour through some of the topics in Mind, Self, and Society: From the Standpoint of a Social Behaviorist (Works of George Herbert Mead, Vol. 1) . The title is entirely descriptive; the core issue is how to characterize the "me" -- the personal, the conscious individual, the intentional actor, and to theorize about how the self is related to the social world. Mead's fundamental view is that the tradition of philosophy has gotten the relationship backwards; philosophers have built the social from the individual, but actually the self is in some important way the sum of its social relations. 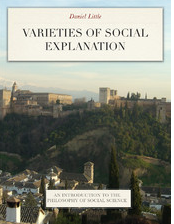 The difference between the social and the individual theories of the development of mind, self, and the social process of experience or behavior is analogous to the difference between the evolutionary and the contract theories of the state as held in the past by both rationalists and empiricists. The latter theory takes individuals and their individual experiencing—individual minds and selves—as logically prior to the social process in which they are involved, and explains the existence of that social process in terms of them; whereas the former takes the social process of experience or behavior as logically prior to the individuals and their individual experiencing which are involved in it, and explains the existence in terms of that social process. (222). Mead favors the "social first" approach. This doesn't rest on some kind of spooky Durkheimianism about irreducible social wholes, but rather the point that individuals always take shape within the ambit of a set of social relationships, language practices, and normative cues. One thing that makes Mead's position here more distinctive is the way that it fits into his broader theory of symbolic manipulation. His ideas about rationality rotate around the human being's ability to use and manipulate symbols. This is what reflective thought involves, according to Mead: to assign symbols to features of he world, and then to choose actions based on reasoning about the relationships among those symbols. This insistence on the primacy of social relationships for defining the self might imply a problem for the first human self; but actually the development of sociality presumably parallels exactly the development of language and action. We aren't forced to begin in a social contract, state of nature point of view. And here is a nice description of purposive action. This is a reasonable statement of the situation of purposive deliberation: the person entertains in thought the various behaviors he/she can undertake and the possible consequences of those behaviors. The person then chooses a behavior in consideration of which of those consequences is most favored. So this passage conforms loosely to the desire-belief-outcome model and provides an explication of an aspect of consciousness and reflexivity. What is perhaps somewhat more surprising, however, is that Mead's position here seems mildly inconsistent with the earlier expressed ideas of the self as a reflection of the social world in which the biological individual abides. This passage suggests more of a traditional individual-rationality approach to action. He turns to the concept of habit to explain language and to describe ordinary actions in the world. "action is relational rather than individual"
-- seem not to originate in Mead. Mead's central contributions (in a Twitter-sized bite) seems to be that the self is constituted and created by its social context; and there is a large component of "habit" in ordinary social action. Many years ago in an unfinished Phd I tried for a while to tie Mead,to Habermas's 'ideas' on truth in dialog and the one way dimension of the radio/TV.....anyone else see a link ? What reference is 222? Where are the quotes from? Very interesting article! These are page numbers to the print edition as recorded in the kindle edition. If we ever do end up acting just like a rats or pavlov's dogs, it will be largely because behaviorism has conditioned us to do so. See the link below for more info.